1-needle, lockstitch machine with double-capacity hook. APPLICABLE: For heavy materials and jeans. ♦ Max. sewing speed - 4000 rpm . APPLICABLE: For leather and heavy-weight materials. ♦ Max. sewing speed - 4000 rpm. ♦ Max. stitch length - 7 mm. ♦ DDL_8700H - Equipped for heavy-weight materials. 1-needle, unison-feed, lockstitch machine with double-capacity hook. ♦ Max. sewing speed - 2500 rpm . ♦ Lift of the presser foot - 10 mm by knee 16 mm. 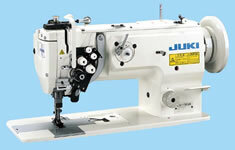 1-needle, unison-feed, lockstitch machine with double-capacity hook and automatic thread trimmer. Cylinder-bed, 1-needle, unison-feed, lockstitch machine. APPLICABLE: For sewing tubular materials such as bags and shoes has an outstanding ability to sew small curves smoothly. ♦ Max. sewing speed - 2200 rpm . 1-needle, top and bottom-feed, lockstitch machine	with double capacity hook. APPLICABLE: Feeds difficult-to-feed materials and multilayered portions of material with great precision. Semi-dry-head, 2-needle, lockstitch machine with organized split needle bar, with large hook. APPLICABLE: For jeans and heavy-weight materials. Semi-dry-head, 2-needle, lockstitch machine with organized split needle bar, with large hook, with automatic thread trimmer. Semi-dry-head, direct-drive, high-speed, 2-needle, needle-feed, lockstitch machine with high and long arm. Separately driven needle bars. 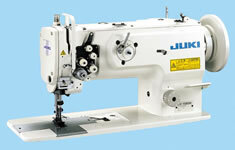 This is the highest grade 2-needle lockstitch machine series launched by JUKI. ♦Max. sewing speed - 3200 rpm . 1-needle, unison-feed, lockstitch machine with a vertical-axis and large hook. 1-needle, unison-feed, lockstitch machine with a vertical-axis, large hook	and automatic thread trimmer. 2-needle, unison-feed, lockstitch machine with vertical-axis, large hook, with automatic lubricating mechanism. APPLICABLE: For an extended range of heavy materials, such as cargo handling belts and containers, car seats, sofas and bags. ♦Max. sewing speed - 2500 rpm . ♦Max. sewing speed - 2000 rpm . High-speed, unison-feed, lockstitch machine with vertical-axis, large hook and automatic thread trimmer. APPLICABLE: Capabilities for sewing car seats. ♦ Max. sewing speed - 3500 rpm . High-speed, unison-feed, lockstitch machine with vertical-axis large hook and automatic thread trimmer. ♦Max. sewing speed - 3500 rpm .